Round up the cowboys and cowgirls for a free “Wild Wild West” themed Fun Day in the Park event on July 17, 2015 from 11 am - 2 pm. The event will take place rain or shine at Shamrock Park in Clare, Mich. and is sponsored by Mid Michigan Community Action Agency (Mid Michigan). Families will not want to miss out on freebies such as books, bike helmets and other goodies along with free food. Fun games like “snake in the boot” and “panning for gold” will be sure to both entice giggles and stir up friendly competition. 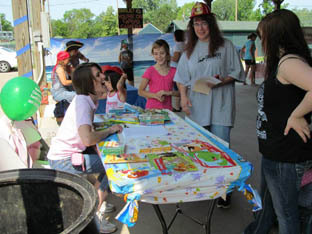 In addition to the fun and games, parents and families will have access to helpful information and community resources. An on-site healthcare navigator will educate and equip families with affordable healthcare options. Quality Preschool Partnership will be signing up children for free preschool in the fall. “With more than 20 local organizations expected to attend, parents will receive the education and resources to be successful and self-sufficient while also enjoying spending quality time with their family,” said Shawna Roskoski, community engagement coordinator at Mid Michigan.